Since we got the rabbits the kids are very keen to get dressed in the morning. They love coming out and helping me give Chocolate and Star their fresh food, water and hay, and they usually add a few dandelion leaves to the hutch as well! Its a good job the garden is full of them! 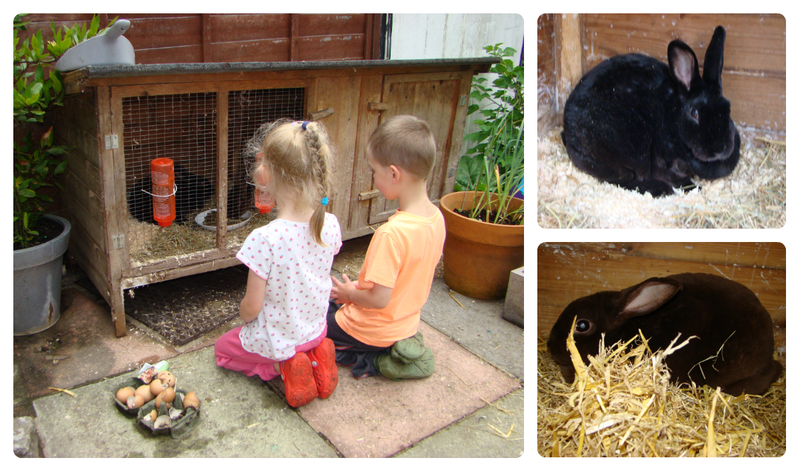 We’ve been using this time to handle the rabbits as well as they are still quite nervous, which makes the kids even keener to help! Once all animal duties had been completed this morning we got Hama Beads out. 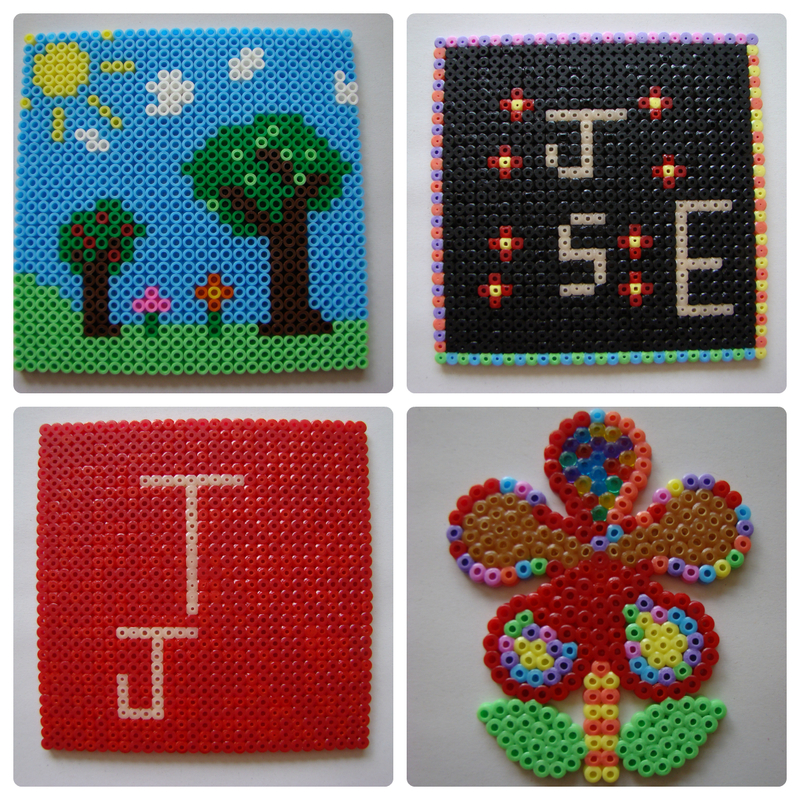 Jasmine has been asking to do Hama Beads for a few days but we’ve been out and about quite a lot so we hadn’t managed to get them out. Today we had no plans to go anywhere other then B&Q after lunch, so we had the whole morning to design and create. I joined in with the kids today and made my own Hama picture. I am hoping that if they see me doing this it will develop their own ideas about what they can design. I explained what I was doing and Thomas said he wanted to make a Lightning McQueen picture. He started off using the red, but didn’t really understand what to do. He actually ended up making a rather brilliant red square with the letters T and J in – and I even let him use my glow-in-the-dark beads for the letters! He worked really methodically, putting the beads in line by line and making the letter shape with no help at all. 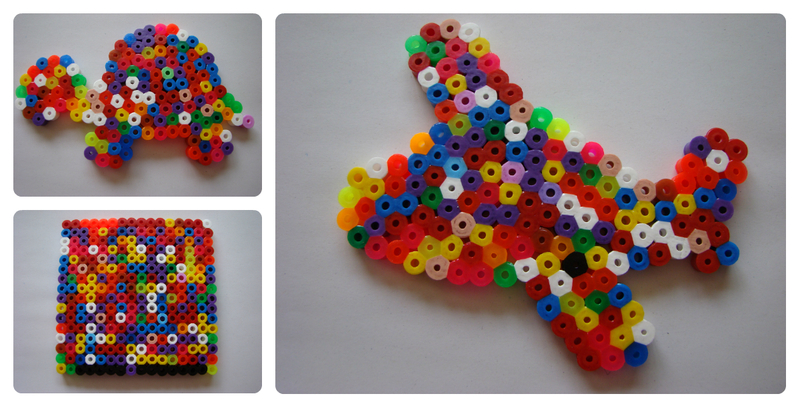 Jasmine began using the flower peg board and designed a pretty flower. She then also wanted to use a square board to “write letters”, although I am pretty certain this was because she knew I’d let her do the letters in glow-in-the-dark beads! She made a square with a patterned border and flowers dotted around the inside. Ben did really well with the Maxi beads today. It is only the last 2 times we’ve done Hama Beads that he has really shown an interest in competing a design. Today he did 3 boards entirely by himself! He sat for ages placing beads on the peg boards, talking about colours and what he was making. It is lovely that he joins in with us now, and makes Hama Beading a lot easier knowing he won’t tip them all over the floor when he has had enough! This afternoon we did go to B&Q. 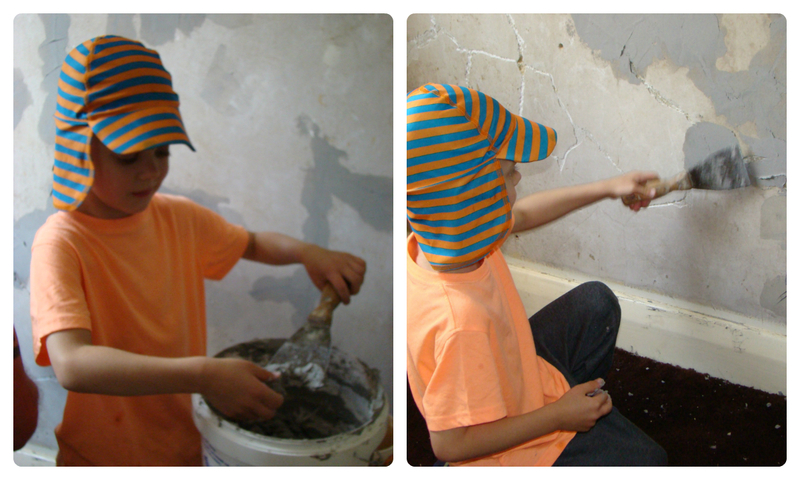 We are currently decorating Ben’s bedroom as part of a competition (more on that in a day or 2!) so we needed wood and a few other bits. Once we got back Jasmine and Ben went into the garden and started a bug hunt and Thomas went to help Gordon do some plastering upstairs. He has helped a couple of times now and is getting quite good at it! 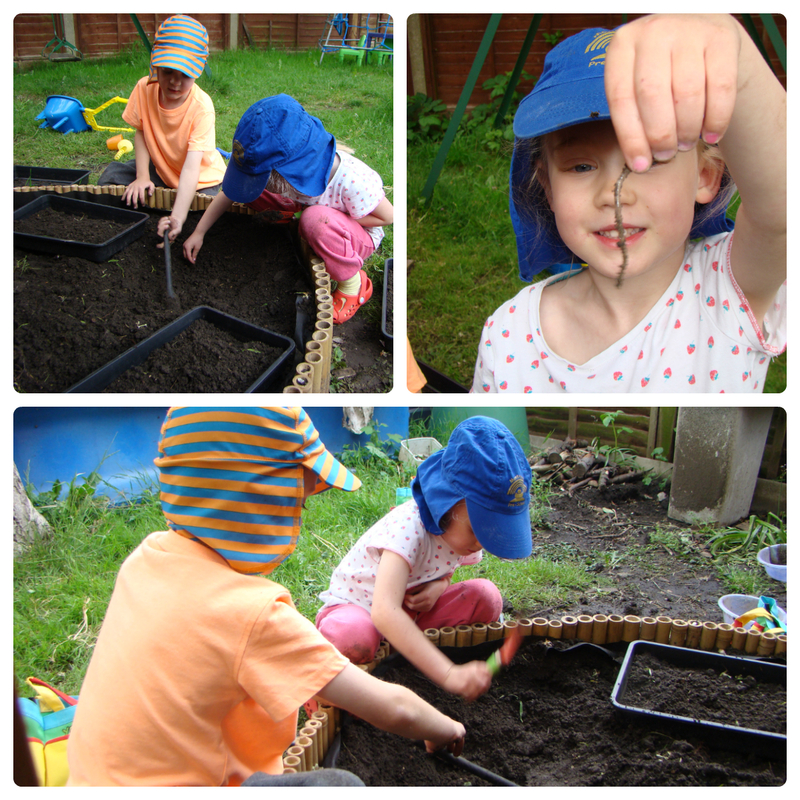 Once he’d finished he joined the others in the garden and they spent the rest of the day digging in their mud, looking for worms and other bugs and collecting them in seed tray gardens! Thanks Lisa 🙂 The kids took their finished designs to bed with them last night!